…knitting, of course. Few activities, or words, or ideas are as important to me as knitting. It gives me so much, and adds a dimension to my life that had gone missing since I left weaving behind, since I became a book woman. Knitting has opened up new worlds: Knitters Review, this huge community of bloggers and blogging, my Thursday afternoon Knitting Circle, and all the people I’ve encountered along the way. 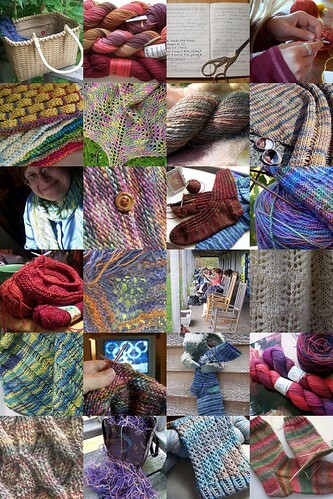 Some of my most important friendships have fiber — spinning, weaving, knitting — at their core. Some of them go back twenty and twenty-five years, and many are just developing, but all of them are treasures. Knitting is the thread that winds its way through every one of my days, and unless I’m stuck on a project, there is joy in all the moments I spend thinking about it, doing it, being a knitter. It’s made me feel creative again, and the other things I like to do — make watercolors, take pictures, spin yarn, play with paper — are more satisfying because I knit and I’ve developed the knitter’s discerning eye. I’m proud of what I can do with two sticks and some string, and every single time I pick up these simple tools I feel strong, and capable, and creative, and content. This is when I am my best self. I am a knitter. That was beautifully said! Knitting is a wonderful thing and I often wonder what on earth I did before I found it. I certainly can’t imagine my life without it, or my knitting friends! Aren’t we lucky to have fiber in our lives. And imagine! It’s a necessity, not just a pleasure, since we all need clothing. Almost enough to make me stop regretting I’m not a dog. what a lovely post Jane. It is a delight to see all the art you create. Lovely knitting words there that knitters worldwide can relate to, well done Jane on a lovely read and the pictures look great too. Oh, Jane, that was a wonderful K! Thanks for sharing – and I know JUST how you feel.